Un film di Gina Prince-Bythewood. 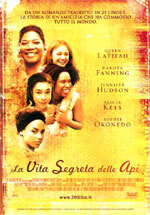 Con Queen Latifah, Dakota Fanning, Jennifer Hudson, Alicia Keys, Sophie Okonedo. Titolo originale The Secret Life of Bees. Avventura, Ratings: Kids+13, durata 110 min. - USA 2008. - 20th Century Fox uscita venerdì 17 aprile 2009.